Winner update: Susanne. I have emailed you. I've raved about this Canadian designer before. I like these patterns because the sizing is perfect, the pattern itself is explained clearly with ample photographs, the designs are original and sophisticated (in a kid friendly way). They call this one Easy Sew and it really is. I made this in under an hour. PDF pattern available in sizes 12 months to 4T. View all Heidi and Finn's patterns in their Etsy shop. Like to win a Heidi and Finn pattern for yourself? Heidi and Finn are giving away one copy of any pattern from their store to one winner; simply leave a comment below to be entered. I will choose a winner via Random.org on February 9th. 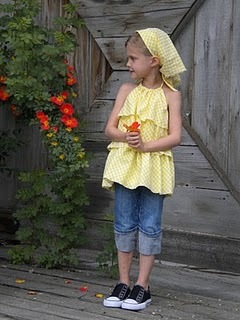 And drop by Brown Paper Packages today for a review and link to this free Oliver + S ruffled halter top pattern. Hmmm... I could use an easy sew pattern! Yours is adorable! Very cute pattern - looks easy, so I think I can handle it! Really cute pattern and different! Would love to win! Love the heads up to a Canadian designer. And the sweater of course, seriously great sweater. It looks so comfy. I currently have this pattern bookmarked, and was contempating purchasing it! It is such a sweet pattern for a little girl. I've always been nervous about trying a PDF. I have no idea why, but clearly I need to get over it because that is cute! What a cute pattern! Thanks! Very, very sweet. I hope I'm having a lucky day! Oooh, I'm hooked on Heidi & Finn... just sewed up her new Cowl Neck dress last night. Love it! Thanks for the chance to win! I really like this, but I can't believe it's easy to sew! It looks so...I don't know... professional? Oooh, I do love things that are easier than they look! Yay for giveaways, too!!! I just tried my first Heidi and Finn pattern too. I made the cowl neck dress and love it! I'd love to win another one to try out. Cute pattern. I love the cocktail swing coat in their etsy shop & the criss cross top. So cute! Thanks for the giveaway. So Adorable! SIGN ME UP! Love the patterns and your finished top is adorable. LOVE Heidi and Finn! Their patterns always make me wish I had about 6 little girls to sew for! This is so cute. I'd love to win. 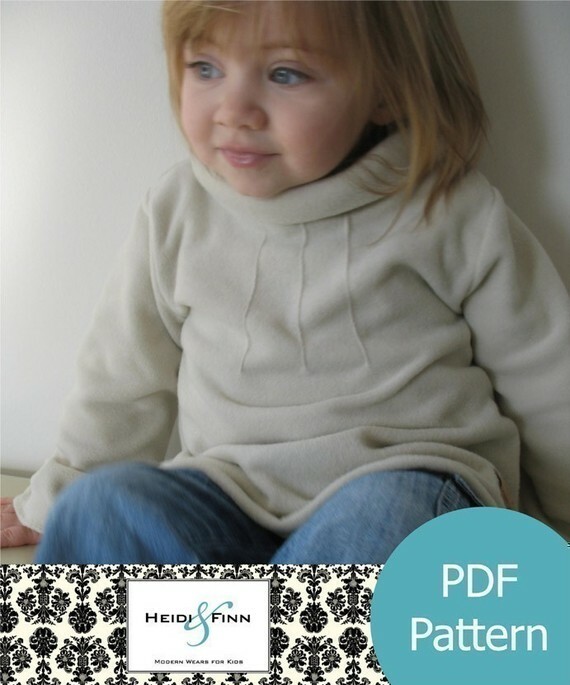 I hadn't heard of Heidi and Finn patterns before but that top is so cute I'm going to look for more. Absolutely gorgeous! Oh I would love this! Thanks for the chance from one of Leisel's readers. oh just as i was saying that i should start with thinking about summer outfits....am sure i could make this one though, it is so cute. thanks for the chance to win cynthia. little v looks so cozzzy in hers. Love their patterns, this one is super cute! I love all her patterns. I think I currently own 7 however I don't have this one. I would really enjoying having a go at it. Heidi and Finn are my favorite patterns!!!! I would LOVE to win this one! Neat!! I'd love to win this pattern!! Im an avid lover of these patterns...there are only a few I dont have and this is one of them, so I'd love to win it! I am new to sewing, but would love to try this out for my daughter it looks so sweet and amazing. I loooove Heidi & Finn patterns and have reviewed a couple on my blog. Love this one! I am a fan of Heidi and Finn patterns are so lovely! Very cute wee model in a very cute wee sweater! I have always loved this pattern but have never got around to purchasing it! I think it might ahve to go on my must sew list for this winter! I have eyeing their patterns for a long time. So beautiful. I would love to win! Great job! I am just beginning so I would love an easy sew pattern. Thanks for the inspiration and the giveaway. that sweater is really cute! What a cozy sweater -- I'm adding them to my Etsy faves! What I love about this sweater is that although it has a high collar to keep little necks warm, it is loose enough not to make a child feel confined. Great design. This pattern is so cute! Please enter me for the drawing. I love Heidi&Finn patterns, and I would love to have this pattern for to make for my little girl! That is an adorable sweater, love to try that pattern for the grand kids. this is so lovely! i think my niece needs one!! I'm a great fan of Heidi and Finn. I've already bought three of their patterns and are all wonderful and so easy to sew! The chic cocktail swing coat is my favourite I've already sewn it three times with wonderful results. I wish I could have all of their patterns! LOVE those clothes!! A fellow Canadian --YAY! I love how your sweater turned out, it's beautiful. In fact, it's so cute, I'm convinced I have to buy that pattern for myself right now! Love, love, love the pintucking detail! Love Love Heidi and Finn!!!! Oh i don't have this pattern !! i love all your pattern ! I stopped sewing the girly cardigan and it's so cute !!! I've never tried a heidi and finn pattern, but they look truly adorable - in an understated way. I would *love* to try one! What a super adorable sweater, I love it! Thanks for the chance. Would love to use up my stash of clearance fleece on this pattern. It's been in my favorites on Etsy for a while and I've actually been planning on buying it for that reason! LOVE Heidi and Finn patterns! OMG!!! I made the mistake of showing the top to my 2 year old daughter.... you know what it is like when a toddler really wants something - "Win it Mommy, Please win it Mommy"
Awesome pattern, love the fast and easy ones! Enjoyed making your yoga pants pattern too, what a lovely giveaway! Heidi+Finn is one of the greatest. I have three patterns already and am working on the second one finally. They are so simple and I love how they look on the girls! I would so love to win this sweater pattern! Ooh. So cute! I'd love to win.